What does Lesbian feminist art looks like? What are Lesbian feminist’s concerns in 2017? How do Lesbians visually illustrate and frame their experiences as Lesbians in a world where the anti-Lesbian backlash is rife? The Capital L room displays a series of work by Lesbian feminists artists addressing these issue and highlighting the richness and diversity of the Lesbian feminist political view point on ourselves and our lives as Lesbians. In creating a powerful, rich and varied joyful yet serious Lesbian culture, Capital L proves that the definition of lesbianism goes far beyond patriarchal’s reductive views of Lesbianism as only sexual. Anne Billows is a lesbian feminist illustrator, writer, filmmaker, organiser and full time activist. She is 30 years old, lives in France and loves using her art and projects to bring across feminist perspectives and politics to a greater audience. Pamela Dodds is a visual artist and printmaker. Her work is exhibited regularly in solo and group exhibitions in galleries and public spaces, and has been reviewed in Art New England, Boston Globe (USA), Globe and Mail (Canada), among others. Recent exhibitions include Lesbian ARTivisms in the Age of Globalization Colloquium, University of Ottawa, Ontario, Canada; Queer Landscapes, Queer Intersections, Aird Gallery, Toronto; Language for a New Paradigm, William Busta Gallery, Cleveland, Ohio, USA. She has received awards and support from Ontario Arts Council, Massachusetts Cultural Council, Barbara Deming Fund for feminist art, among others. Collectors include Purdue University, Carleton University, Boston Public Library, Cleveland Museum of Art, and many individuals. She lives in Toronto, Canada. Rowan Dykewood is a proud bearded lesbian artist. 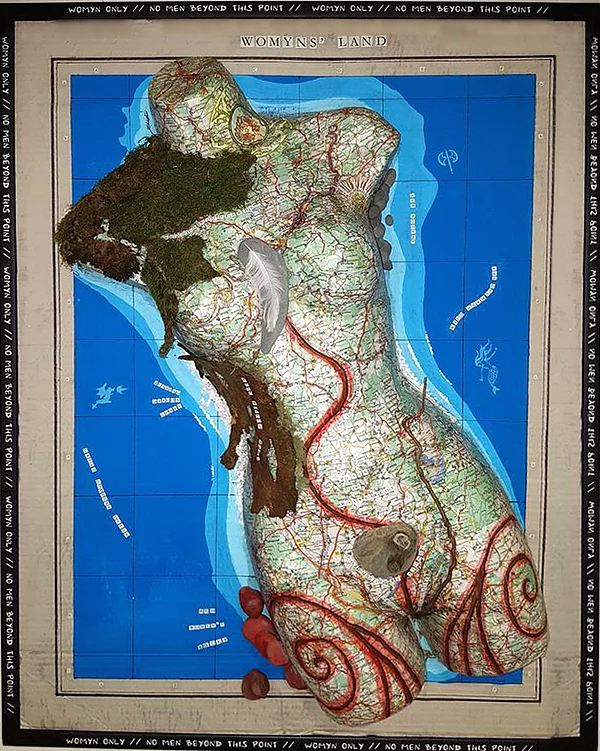 Shonagh Glen, born in Scotland in 1982, Shonagh Glen doesn’t call herself an artist – rather a feminist propagandist and songwriter, and a better gardener than either. Nicole Jones is an artist based in Edinburgh. Her work, in various mediums, centres on people and explores themes like the body, self and subconscious. Sudie Rakusin is a visual artist, sculptor, children’s book author of the Dear Savannah Blue series, and illustrator for established authors Mary Daly, Carolyn Gage and Patricia Monaghan. She is the owner of Winged Willow Press where she uses her original painting and drawings to create coloring books, divination cards, illustrated journals and more. Rakusin’s artwork includes oil on canvas paintings (many of which include sculpted papier-mâché features and beadwork, which push her 2-D work into a 3-D realm), cold wax and oil paint abstracts, papier-mâché sculptures, and pen and ink drawings. She believes her creations are the best part of her. Art is where she goes for refuge, replenishing, and how she pays homage to what sustains her. Sudie was born in Washington, D.C. She currently resides in Hillsborough, NC, in the woods, on the edge of a meadow, surrounded by her gardens, with her Great Dane, Fiona Fig, and Pitt/Boxer, Marmalade Moon. Newer PostExtra lunchtime sessions for young women at FiLiA!